I don't think it would be boring to not have commentary if the video content is good and the music isn't horrible, lol. Worlds. Biggest. Lava. Lake? This picture doesn't really do it any justice, it stretches a lot further than this, but a few ghasts appeared and I had to get out of there before they blew up the precarious ledge I was standing on! Anyhoo.. .I'm going to get back to my project. Only two more "stages" to go but they both require me to gather huge ammounts of resources .... Back to the grind stone! Whoa, lava ocean more like! I don't think I've met a single person who actually likes the glowstone texture. Haha. I guess it would come in handy for a natural-looking light source or something, but never for anything I would use. TPs FTW! Haha. And that is the second biggest lava ocean I've ever seen. Mustafar's is, of course, bigger. =P Haha. That picture represents just a small portion of the lava lake.. trust me. It's WAY bigger! Mustafar's a planet of volcanic activity. Pretty sure it's got your lava ocean beat. =P Haha. But that is the largest lava ocean in Minecraft I've ever seen. And I agree with daydrifter. Haha. 67? that's not bad. What was #1 ? Mustafar's not real. Haha. It's at the end Star Wars: Episode III. Guess you're not a fan? =P Haha. 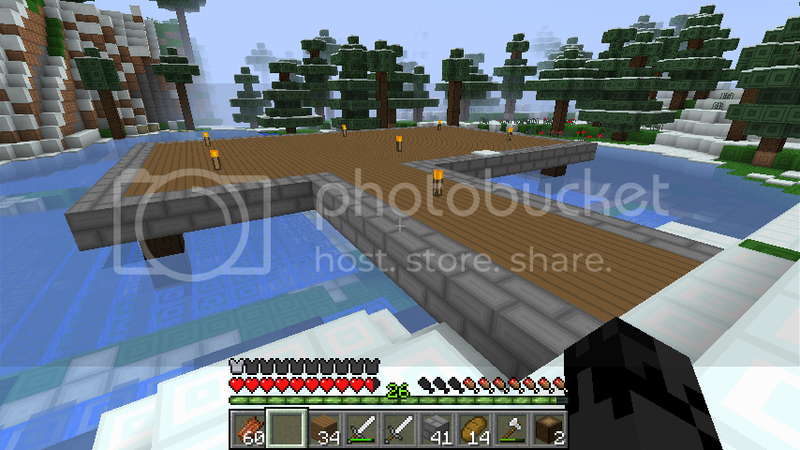 Started work on the base of the pier/dock/thing on the frozen lake. 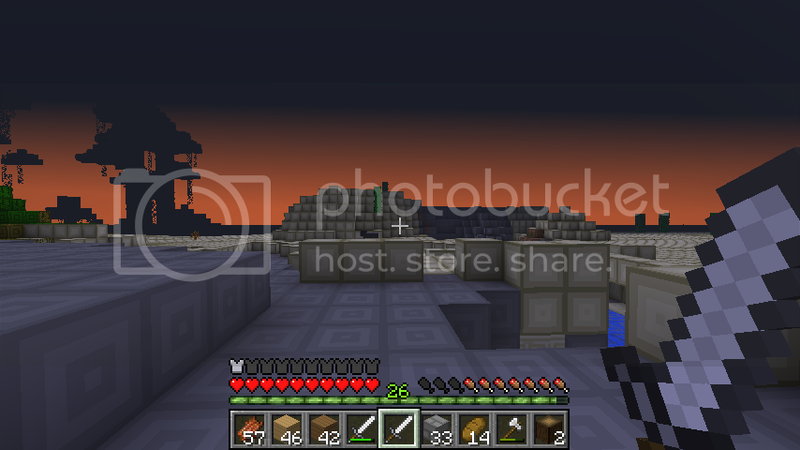 It turned night-time, though, so I had to quit for the day (and grind some zombies, haha). Oh. :/ I'm a huge Star Wars fan :D I just hated. No detested. No. LOATHED the prequels. I went to the cinema and walked out on Episodes I, II and III before they finished I was that disgusted. ((I kept hoping they would get better. they didn't)) That's the first - and literally - last time I've seen those films. On the other hand, the original 1977 Star Wars [or Episode IV - A New Hope if you will] I've seen literally hundreds of times and remains my all time favourite film. Star Wars: Episode III is probably my all-time favorite. Why'd you hate the prequels so much? 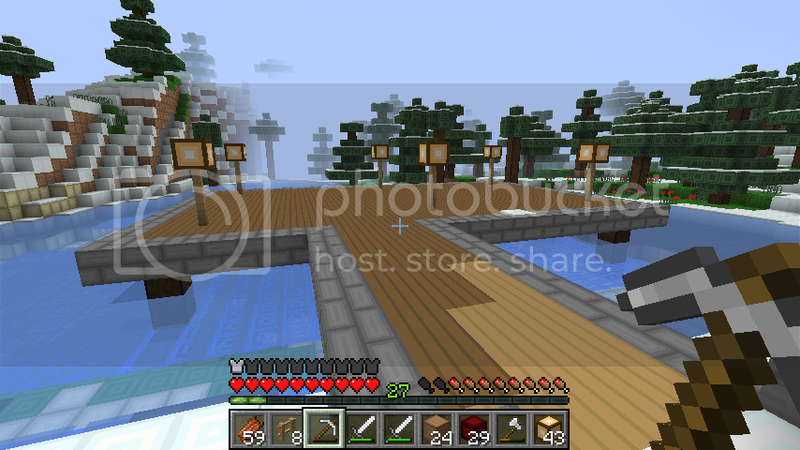 Yeah, the pier/dock/thing is coming along. Well the base of it, at least. Haha. And try "favorite" and "recognize," the American spellings. Haha. Google is an American company, after all. Forty-seven! I shall start saving up my levels for that, then. Thank you, sir! It was awful [Episode III that is] : Awful acting [especially Hayden Christensen - my WARDROBE can act better than him, but they were all bad] - awful script [seriously George Lucas has lost the plot; actually to draw this simile out a little, I don't think he even he even had the plot to begin with] ; Jar Jar Binks - the less said about him, the better. Awful Special effects - yes i thought they were awful; I much prefer Models to CGI, even though you know they're models, they look more "realistic" CGI looks soooo fake. So many plot holes, it would put the entire Swiss Cheese industry out of business! Um.. anyhoo. I didn't like the prequels give me: A New Hope - or better yet, The Empire Strikes Back - any time. Well, I completely disagree on all those points, but those are your preferences, so that's cool. Haha. I really need to do a SW marathon very, very soon. I know right?? All this Star Wars talk is making me want to whip the movies out and start them up. Hahaha. Oh, welp, I can't help but go off topic and talk about Star Wars...darn you guys! I think I may be weird for probably liking the music of Star Wars more than the movies themselves, but yeah, I'm a fan of the ORIGINAL Star Wars trilogy, not the new stuff. Sorry Gil! Though man, I remember being so hyped up about Episode I. I didn't think it was that bad...The soundtrack is amazing! Some of the characters were great. I loved Qui Gon and Darth Maul. And the costume design!!!! Queen Amidala/Padme's makeup and costume alone heavily inspired my own character designs...I even liked the Gungans. Just not um, you know. The really annoying one we get stuck with. The Boss guy was much more enjoyable as a character, in my opinion of course. Okay I need to stop myself from going on. I'm sure you'll get a Fortune Pick soon, I got another bane of arthropods II sword yesterday so, hopefully I took away your bad luck. You should enchant another pick, you might get lucky! I would gladly give you my Fortune II (sorry I can't....I can't part with my Fortune III, I'm selfish!). If we were on a server. I do love this project, it's a great concept, but sometimes I wish we could share things. If only there was a way to trade items with other players. Hm, that could be an idea. You could friend other players and send them stuff from one of your worlds, and they could use it in one of theirs, wouldn't that be awesome? 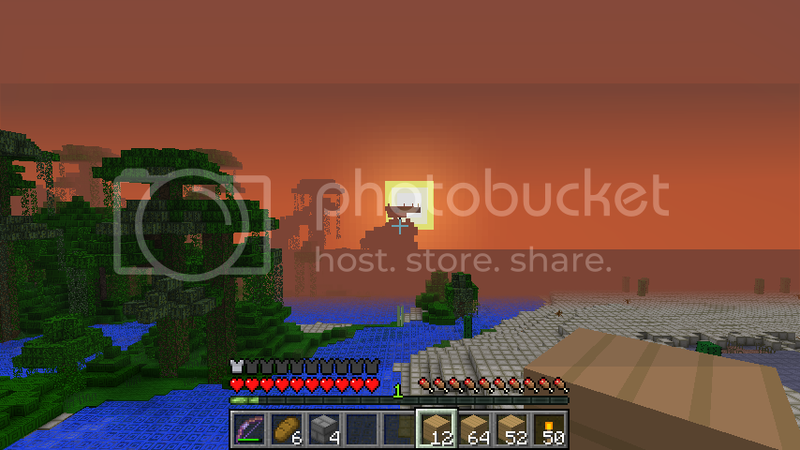 Check out the new snapshot - you can invite LAN friends into your single-player world. No worries. Haha. I don't think I've met a single person that likes the prequels better than the originals. =P I mean, I like them, but I don't know if it's possible to meet myself. Haha. Oh my gosh, the music, yes! I love John Williams so much. May be a little biased due to all the awesome horn stuff he puts in his pieces; just makes it more awesome! Haha. Your own character designs? I might start carrying a bed in my inventory, actually. Not a bad idea, Zyrandar! I need to grind zombies, anyhow, to get to level 47, though. Haha. So I don't need it right now. LAN connections are implemented?? Dude, that makes me soooo very, very happy. 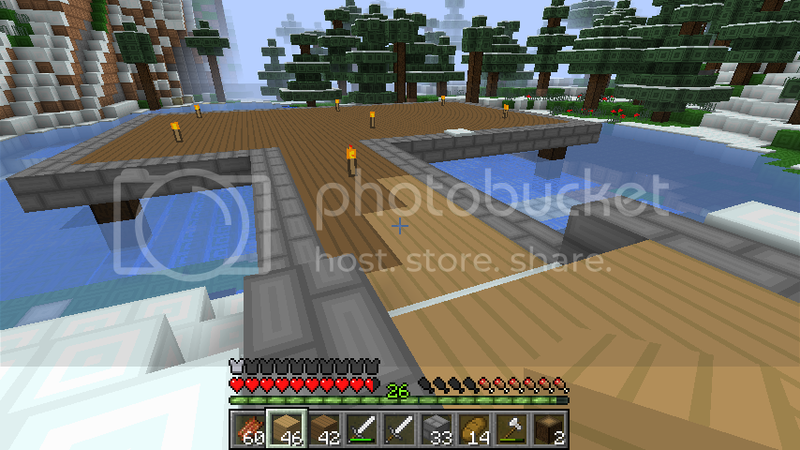 The pier/dock/thingy is finally done! Here're some pictures. This is before I mixed the wood together. And this is after I mixed the wood together. I forgot stairs are only available in one color. I wanted a nice transition. *Nods. And make it out alive without seeing a single Ghast. 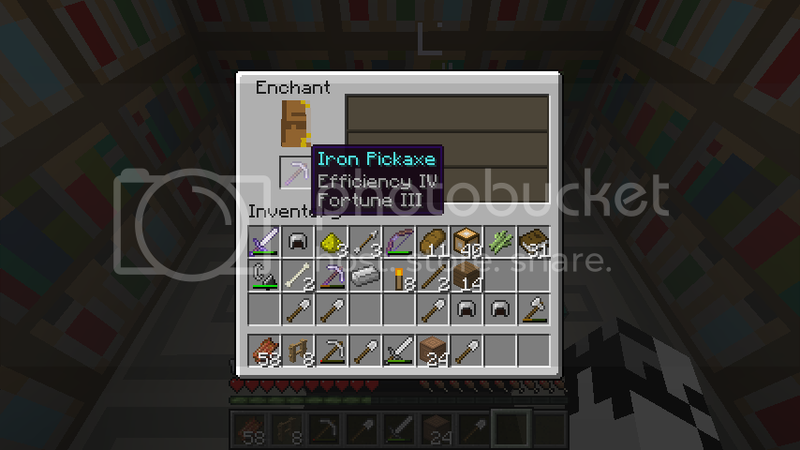 Got some glowstone dust, as well. =) Going to come in handy when I start fancy-ing up the pier/dock/thing. And here we have a random pumpkin. 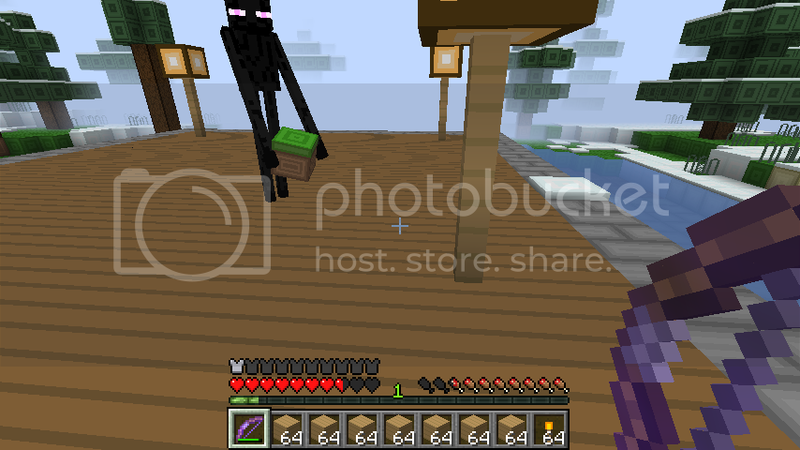 I think an Enderman must have misplaced it or something. Haha. 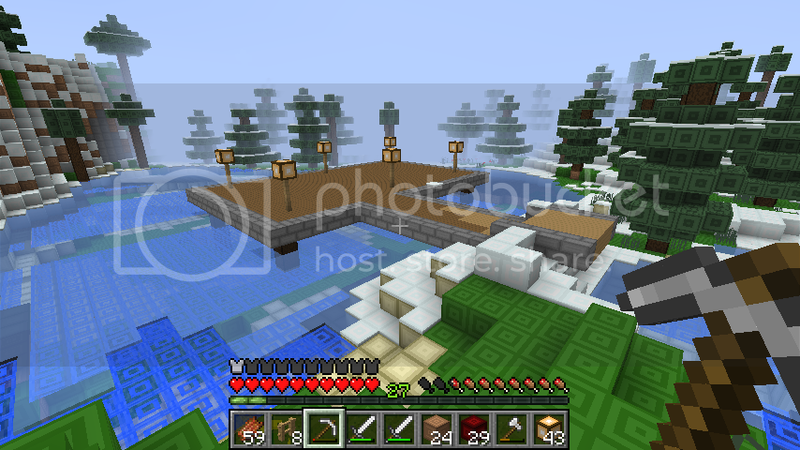 And here's the finished pier/dock/thing complete with glowstone. =) Now all it needs is houses. Yay, the dock is finished! I like that you gradually blend the wood colors. Smart move. It looks great, Now I can go ice fishing! Looking forward to the houses now. I think ice is going to be able to be picked up with Silk Touch in 1.3. Any plans with ice for the area? 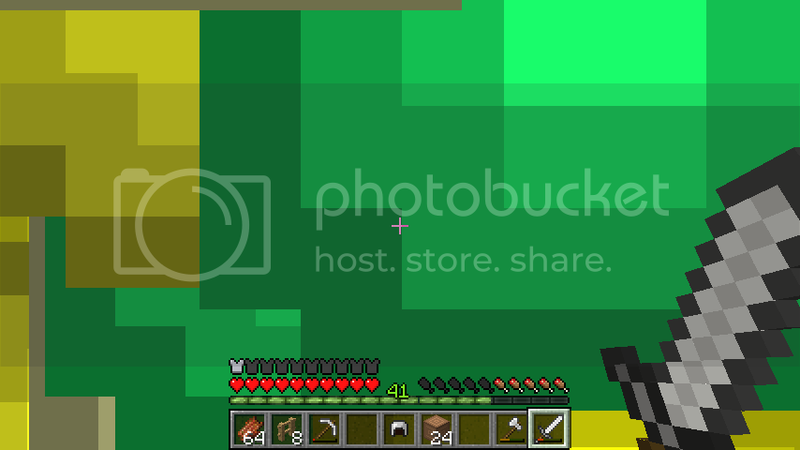 Ooh, new snapshot!!! Must go check it out. Being on a server with you guys would be fun. It wouldn't be so scary in any case. 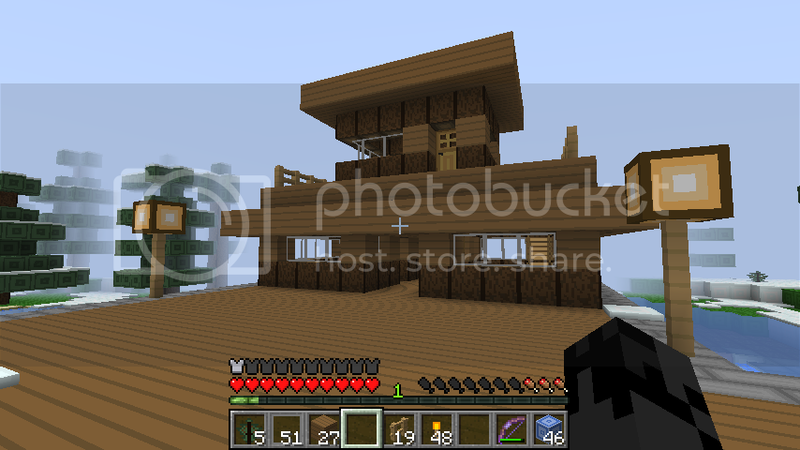 Never been on one so I'd feel like a Minecraft newb all over again. Wow, that dock is great! 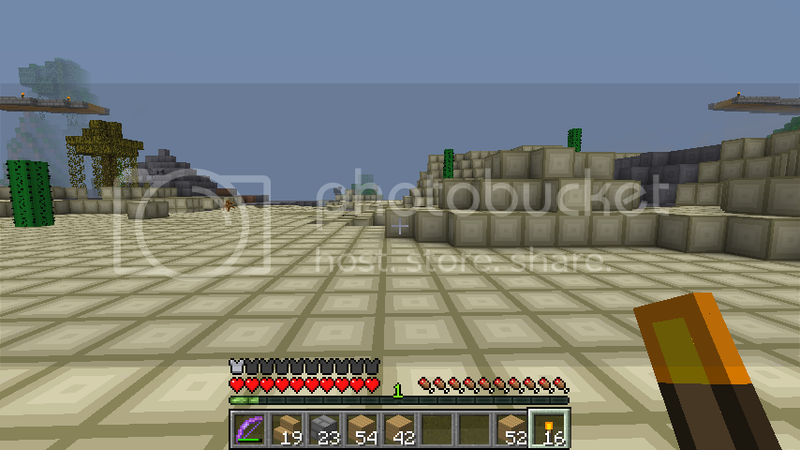 I can't believe you went to the Nether and didn't see a single Ghast! Oh man! I can't avoid the damn things! I hate ghasts so much! 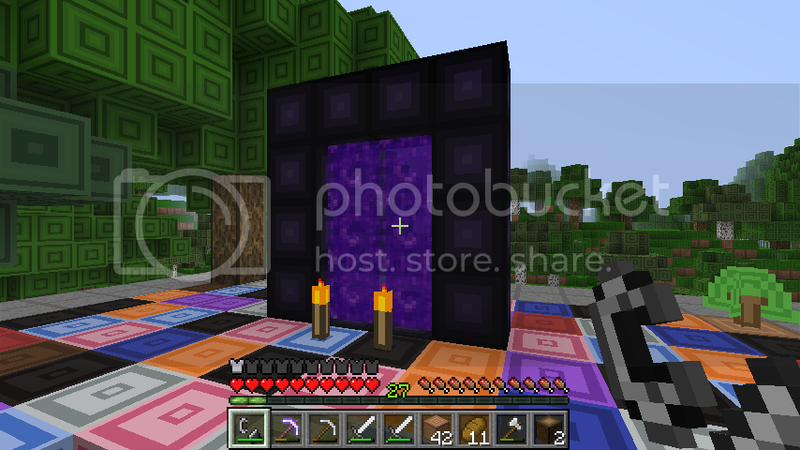 The glowstone in that texture pack is really nice, sorta reminds me of the glowstone in OCD texture pack. @daydrifter - Hurray for ice fishing! Haha. I actually didn't have any plans for the ice in the area, but I've been more and more engaged in Stronghold Legends lately, which has an ice-class, so I may do some sculpture or building inspired by that. And yeah, John Williams is fairly unique. I actually played a piece a few years ago by a composer that he might have picked up some attributes from, (that's what my director said, and he too is a huge Williams fan). There was a sextuplet run and lots of dotted eighth-sixteenth notes throughout. If I can just find the name of that guy! Or even the piece! Have no idea where it could be... Haha. @Wartower9 - Why thank you, kind sir! 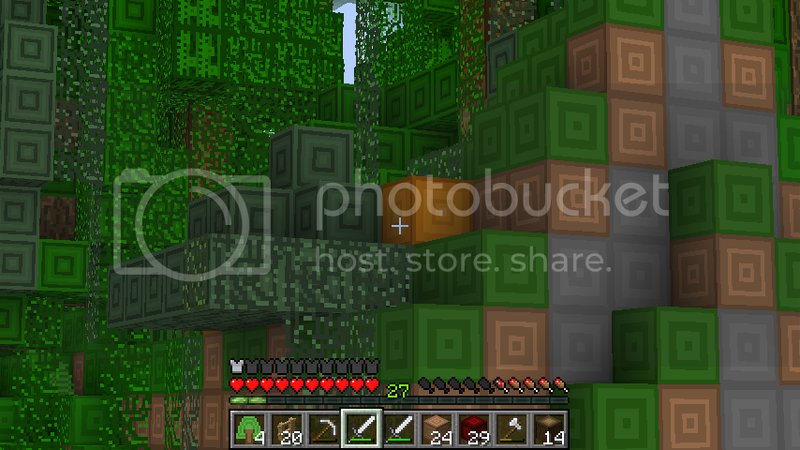 And the texture pack is amazing so far, man! I haven't found much of anything I don't like. =) Any idea of when the items will be done? Don't want to rush you or anything, of course, but I'm curious what they're going to look like. @Zyrandar - That would be ideal to replace the stairs with half-slabs! Had no idea they were doing that. I could potentially move the transitioning wood colors down the bridge to maybe the plains biome or something, then, and have the wood in the taiga all match. Yep, I never see Ghasts. Haha. I hear them all the time, but they never come out of hiding or within my view. *Shrug. Yeah, the glowstone is amazing, Wartower! Looks like lamps. That last statement made me feel awesome and heroic until dropping me and making me feel senile. Hahahaha. 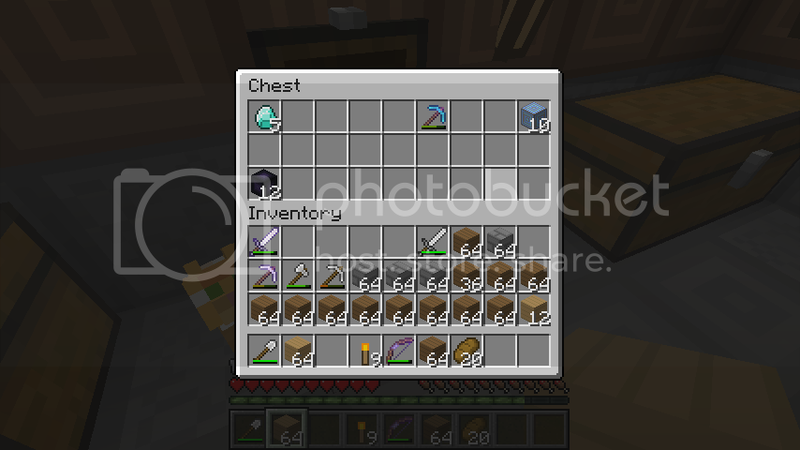 All that iron stuff on the bottom row of my inventory was gotten in one mass killing of zombies. =) It made me happy. Thank you, Zyrandar! Level 47 is my new best friend. Haha. 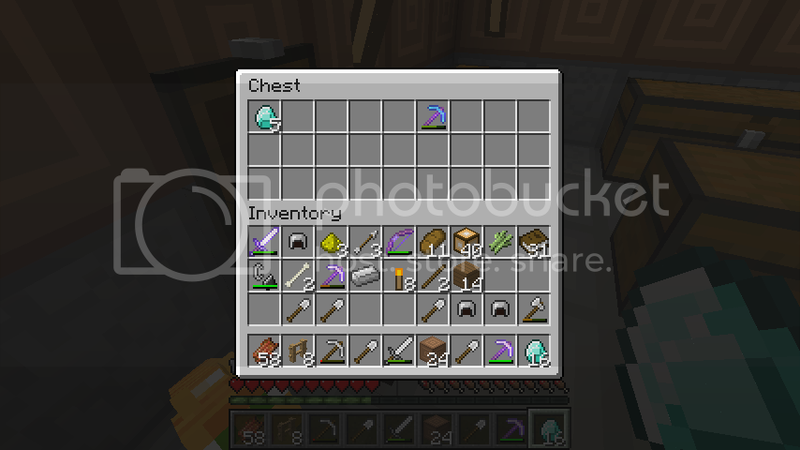 Nice diamond haul bro :) Care to explain the first picture? Are they XP orbs? @wartower9 - can i have a download link for your TP? I'd like to see if I can copy and paste the glowstone texture into default if possible. @gilbert- In two or three days I'll have way to much time on my hands, and I'll do some items. Not so much yet, unfortunately. Ooh a Fortune III pick! Very nice. @daydrifter - I know, right? The sight of those torches in the distance made me so very, very happy. 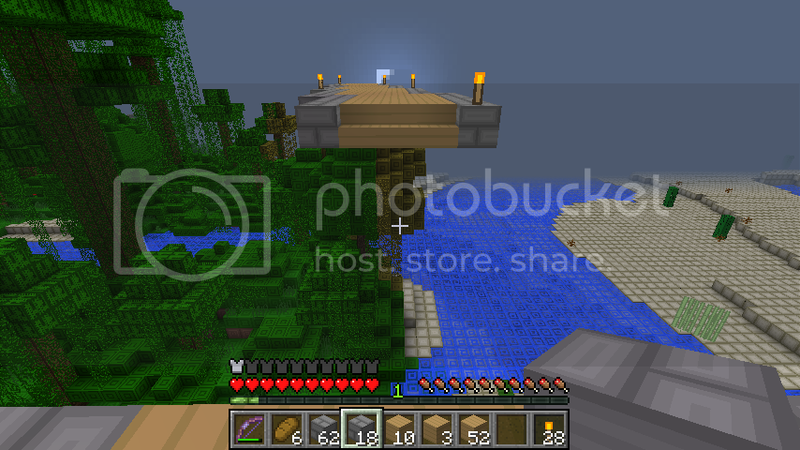 And with that, the bridge from my house to the WIP village is now complete. It passes through five biomes and takes one and a half minutes of sprinting and jumping up stairs to get from one end to the other. Don't know the exact amount of blocks it took, but if anyone is dying to know, I could use one of those confangled adding machines to figure up an approximation. Haha. Now to work on the village! And hopeful ice sculpture, though, it'll probably turn out to be just a giant, unrecognizeable mass of ice. Haha. So, time to make a ton of speed potions? 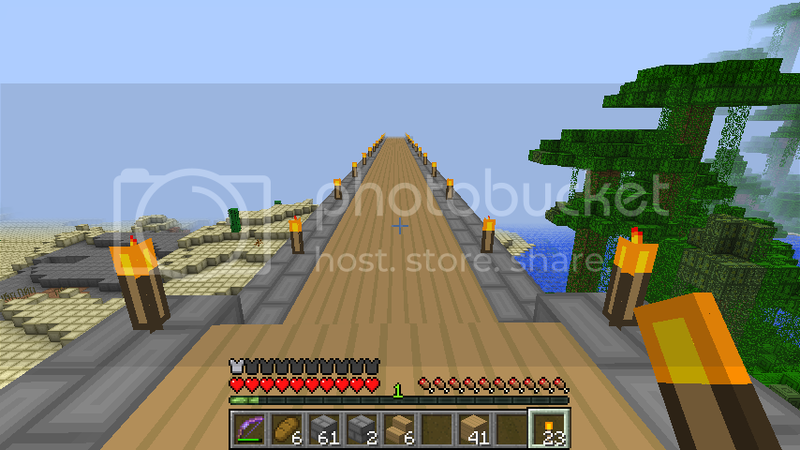 Thats a long, long bridge. That's actually not bad idea. And if I had any Nether Wart, I would totally do that. But alas, I do not. Haha. And I'll be permanently moving by base (hopefully) pretty soon, so for the time being, I'm just going to stay in this. *Shows picture like Vanna White. I will need to run back to my first base for all my food, though. 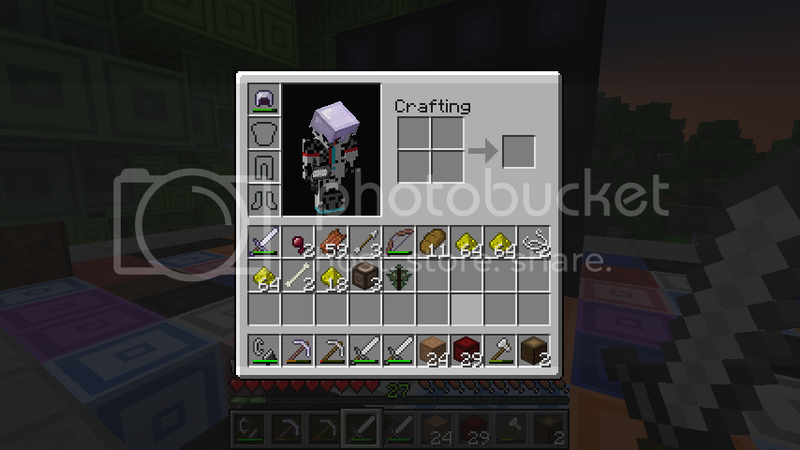 I already ate all mine in my inventory (notice my hunger bar). Haha. Anywho, I'm thinking of making the top part of the building more off-center. Any input? Looks a little too... something. Or maybe making the roof more like the overhang on the bottom would fix it. I'ma try that tomorrow. Haha. Anywho again, I hope for the next video update to walk along the bridge so you guys can get the full effect of it and then show off the (hopefully) complete village. Speaking of getting the full effect, when were the dates for the save file uploads? Or are we not doing that? Seems like it was either July or June 18 as the first one, but that was a while back. Haha. At least you still have food... I've been going hunting.